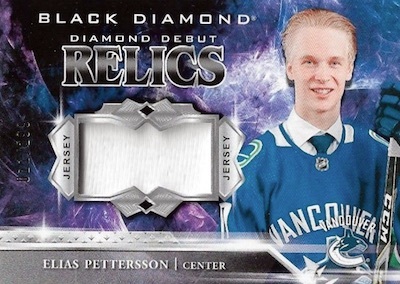 While the format may not have mass appeal, 2018-19 Upper Deck Black Diamond Hockey stays with the five-card boxes. There is also a bonus Exquisite pack in each box that has one card. This overall yield of six cards per box is the same as 2017-18. Similar to past years, collectors can find diamonds embedded in cards for the top rookies and stars. This is also the first chance to see the '18-19 NHL rookies with a larger assortment of autographs and relics. Refreshing the main design, 2018-19 Upper Deck Black Diamond Hockey starts with 50 base cards that are each numbered to 249 copies. These have Pure Black (#/99) parallels, as well. A brand staple, Diamond Relic Rookies features Single, Double, Triple and Quad Diamond RC versions, each numbered to 99. There are also Diamond Relics cards for veterans, but these are capped at five copies apiece. 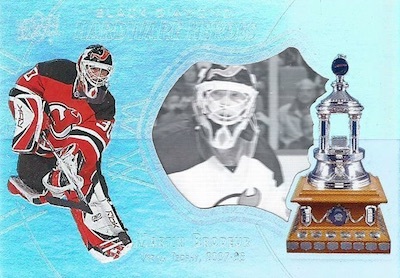 Patrick Roy is the Retro Quad Diamond (#/33) subject this time around. 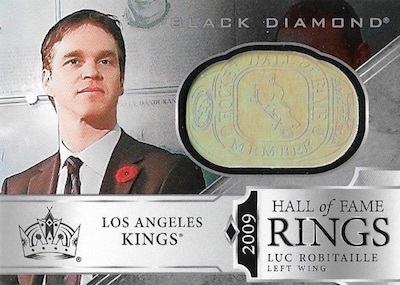 In addition, the diamond cards all have a one-of-one Pure Black parallel. 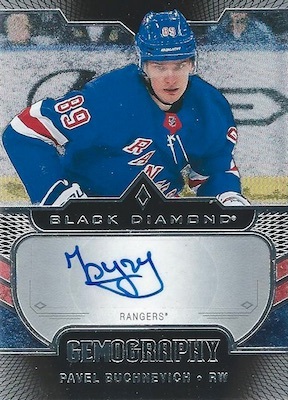 While the remaining cards are not just autographs or memorabilia cards, the 2018-19 Upper Deck Black Diamond Hockey checklist does present a fair amount of quality with the various inserts. 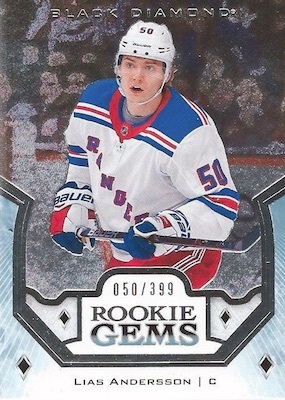 Rookie Gems (#/399) returns and is joined by Diamond Cutters (1:25 packs), Diamond Might (#/99), Hall of Fame Rings (Base - 1:6; Gold - 1:13), Hardware Heroes (#/99), and Run for the Cup Silver (#/99). 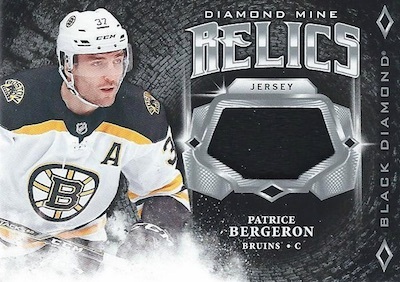 Naturally, many of the hits in 2018-19 Upper Deck Black Diamond Hockey center on the rookies. 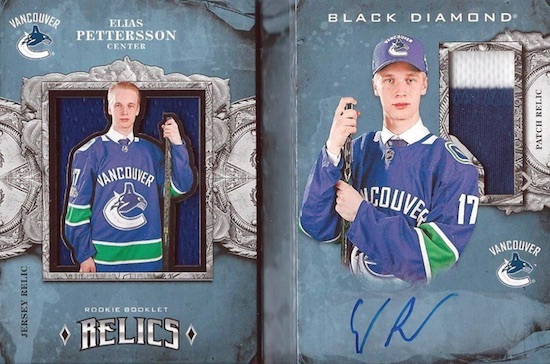 The Rookie Gems Pure Black Signatures line comes in Tier 1 (#/199) and Tier 2 (#/99) numbering, while the Silver on Black Rookie Signatures set also has two limited groupings via Tier 1 (#/249) and Tier 2 (#/99). Other first-year content consists of Rookie Team Logo Jumbo Patches (1:2 packs), which adds Autographed Alternate Logo Tier 1 (#/99) and Tier 2 (#/49), plus NHL Shield Logo (#/5) parallels. Even more options come with Diamond Debut Relics (Base - #/299; Premium - #/49) and Rookie Booklet Relics (Base - #/199; Auto Patch - #/99). 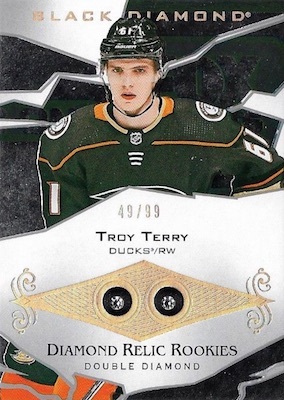 The rest of the 2018-19 Upper Deck Black Diamond Hockey checklist is filled with veteran and retired subjects. The base set is expanded further using numbered Relics (#/149), Retired Relics (#/49), Pure Black Premium Relics and Pure Black Signatures. Additional autographs are waiting in Silver on Black Signatures, Gemography (1:6 packs) and Hall of Fame Rings Gold Autograph. Incorporating manufactured or player-worn pieces, the Championship Banners, Diamond Mine Relics (1:5 packs), and Team Logo Jumbos (1:5 packs) sets all return. Team Logo Jumbos adds Gold Full Team Logo (#/15), Alternate Logo (#/5) and NHL Shield Logo (1/1) parallels, while Championship Banners has a Gold Autograph edition. 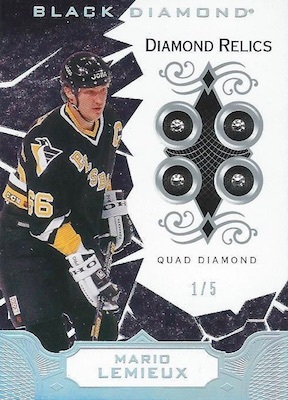 And, finally, that brings us to the first installment of 2018-19 Exquisite Collection Hockey, which is released in 2018-19 Upper Deck Black Diamond through the one-card bonus packs. This initial wave goes big on rookies with Exquisite Rookies (#/299 or #/199), Exquisite Rookie Draft Day (#/99), and Exquisite Rookie Patch (#/299 or #/99). All these sets offer Gold Spectrum parallels. There are Exquisite Rookie Jumbo Material (#/10) cards that have a Shield (1/1) parallel, as well. Collectors can also find 2003-04 Retro Rookies (#/225) and Exquisite 2003-04 Retro Veterans (#/99) cards with Gold Spectrum (#/25 or #/10) versions. Numbered Exquisite Base Set Veteran Materials and Gold Spectrum (#/3) cards close the set with some final memorabilia options. 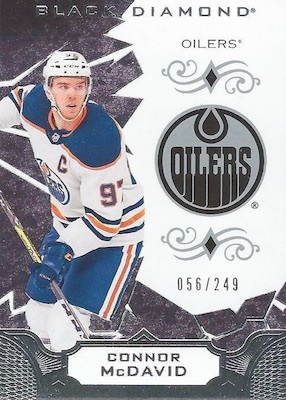 Shop 2018-19 UD Black Diamond NHL cards on eBay. PARALLEL CARDS: Diamond Relics #/5, Diamond Relics Pure Black 1/1. PARALLEL CARDS: Diamond Relics Pure Black 1/1. 45 cards. Only second column is signed. Overall odds - 1:6 packs. Group odds noted below. PARALLEL CARDS: Gold Shield #/5. PARALLEL CARDS: Patch #/49 (No Dahlin*). Overall odds - 1:5 packs. Group odds noted below. Overall odds - 1:2 packs. Group odds noted below. PARALLEL CARDS: Gold #/15, Gold Alternate #/5, Gold Shield 1/1. 12 cards. Serial numbered #/99. 15 cards. Serial numbered #/399. Shop 2018-19 UD Exquisite cards on eBay. PARALLEL CARDS: Gold Spectrum #/3. PARALLEL CARDS: Gold Spectrum #/10. 10 cards. Serial numbered #/225. PARALLEL CARDS: Gold Spectrum #/25. View the full 2018-19 UD Black Diamond Hockey checklist spreadsheet. 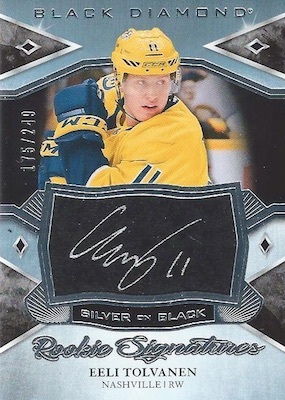 curly swirls on cards are the WORST possible things to add on hockey cards. Please NO MORE curly swirls on cards..
it just shows how bad UD is at card design and they cant some up with any better ideas..
UD Guy #1 — hmm.. we have to come up with a new design for Black Diamond this year..
UD Guy #2 – geez, thats rough.. do you have any good ideas? UD Guy #2 – Yay!..way to go! really?? UD needs some new UD design guys… sorry but this is an epic colossal fail. not to mention tons of $5 value rookie autos numbered to 199 and 249 in multiple subsets. since they already have a product called the cup for which you need to wear one to buy the product..
See above to explain my rating…this is garbage at the price point. Price point is too high and too many Travis McDermott rookie cards. No Brady Tkachuk auto rookie cards either. Same comment as above. Those manufactured patches have no place in a $200 + 6 cards product. Simply one of the worst product I have seen so far. I’m so happy to see so many Travis Dermott rookie cards; a good Newmarket kid, he deserves it. He looks like an elite player in the making, he does so many things so well.